What’s most important for thermal design? Good thermal design always is based around good insulation. There are two other factors which add to the comfort and energy efficiency of solar designed houses. They are solar gains (window orientation and sizes) and thermal mass (concrete, furniture, books). You will never go wrong adding insulation, and keep in mind that the NZBC is just an acceptable minimum. Don’t feel shy to use twice as much insulation as the Code requires. It pays in terms of comfort and quality of life. Then add a good portion of East and North facing windows and the thermal mass and overhangs/awnings to deal with the solar gains. Radiation is either visible or invisible infra-red. Houses for example receive visible radiation through sunlight or electric internal lamps. This light is absorbed by the walls, floor, furniture, etc. These warm up and re-radiate some of the heat, but this time as infra-red light. The best way to stop radiant heat escaping are reflective materials. That's how reflective foil insulation works. Convection describes the movement of warm air. Convection can be used in solar designed houses for moving warm air from one part of the house, for example a conservatory, into other parts. If the house is designed well then this convection occurs automatically without the use of fans. The basic principle is that warm air always rises, and with the proper house layout that effect can be utilised. Convection heating is useful in smaller rooms, which are reasonably well insulated. To stop convective heat from escaping you obviously need to stop the air movement to the outside, i.e. you draught strip the house and reduce infiltration by using tight window seals, flue restrictors for fire places, etc. Most of the heat losses in our houses occur through conduction through the various building envelope parts, such as floors, walls, roof and windows. The effectiveness of a material to stop conduction is described by the 'thermal resistance', better known as 'R-value'. There are no pure conductive heaters, however, for example a heated floor, which feels warm to the feet, conducts heat into the body. Another example would be a heated blanket. 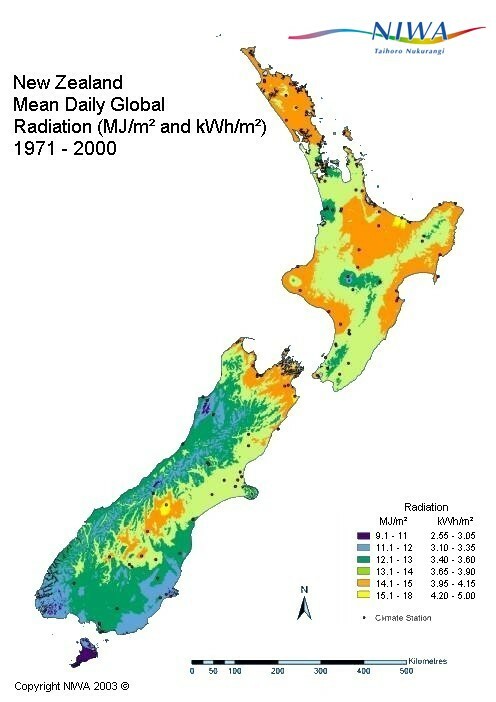 New Zealand has a temperate climate which is ideally suited to building low energy houses. Temperatures are relatively mild and in a well insulated and designed building the amount of sunshine is sufficient to keep the house warm with minimal additional heating. Even in low sunshine areas the average daily amount of free sunshine energy is over 2.4kWh per m². That is equivalent to a 2kW heater running for 1.2 hours. New Zealand houses have generally more than 30m² of window area. Although these are obviously not all facing the sun all day the total amount of free solar energy is significant. The following climate charts were provided courtesy of the National Institute of Water and Atmospheric Research (NIWA). 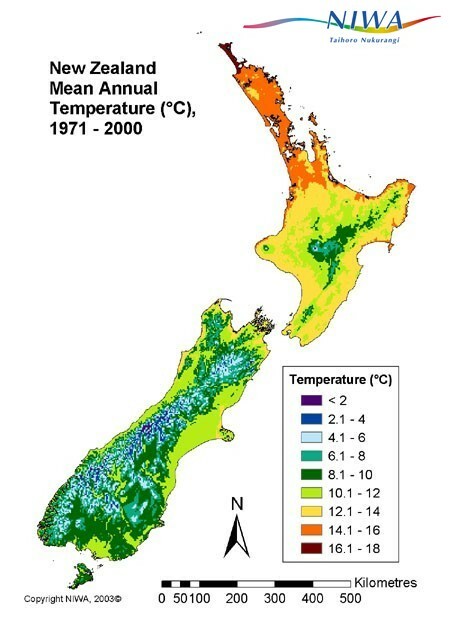 Climate statistics for particular locations, and more spatially detailed maps for some climate elements can be obtained from NIWA's National Climate Centre. Disclaimer: The maps are based on data from a finite number of observing stations, with values away from observing sites being estimated. Neither NIWA nor the author of this website accept any liability arising from the use of these maps. R-values describe the thermal resistance of materials to conductive heat-loss. R-values are measured in 'm² ºC/W' (square meter x degree Celsius / Watts). The heat flow is calculated by dividing the area of the material through it's R-value. So, if a material has an R-value of 2m² ºC/W, it means that for each ºC temperature difference between the front and the back, 0.5W of heat will flow through each m². If the R-value is 0.25m² ºC/W, then 4W of heat will flow through 1m². If there is 5ºC temperature difference, i.e. 20ºC inside and 15ºC outside, then 5x4W = 20W will be lost through each m². To calculate the heat loss for the whole building you need to add the heat flows through all parts (walls, floors, roofs and windows) and multiply the sum with the temperature difference between in and outside. On the surface of materials a thin layer of still air collects. This air film adds a small amount of insulation. The amount of thermal resistance (R-value) of the air layer depends on the amount of air movement. Therefore it is smaller on the outside of a building than on the inside. NZS4214 suggests to use R-0.09m² ºC/W for an inside layer and R-0.03m² ºC/W for an outside layer of air. For materials with small R-values the surface resistance can contribute a lot to the resistance. Single glazing, for example, has an R-value of 0.15m² ºC/W including surface resistances. So the glass itself has only an R-value of about 0.03m² ºC/W. Thermal bridging occurs when the insulation layer is interrupted by materials with lower R-values. A typical example for thermal bridging is the framing in an insulated wall. Because the timber has a lower R-value than the insulation heat can escape quicker through these parts. The critical part to realise is that this effect is not proportional to the area of the thermal bridge. For example a 2% area gap around insulation in the roof can reduce the R-value of the roof by about 20%! Thermal bridging is also one of the reasons why the R-value of a building component (wall, floor, roof) is not the same as the R-value of the insulation in the cavity, but generally lower. 1. Calculating the first case is actually quite simple. You simply add up the R-values of the different layers to get the overall R-value. with A%1 the percentage of the area of material 1, A%2 the percentage for material 2 and R1 and R2 the respective R-values. To get the R-value of the total wall you then would have to add the R-values of the cladding (R-0.01 for weather board), the lining (R-0.04 for 9mm lining) and the surface resistances (R-0.03 on the outside and R-0.09 on the inside). So the total wall R-value in this example is 0.03 + 0.01 + 1.41 + 0.04 + 0.09 = 1.58. Which windows to double glaze? Double glazing is (still) expensive. But considering the low R-value of single glazing it certainly makes sense to double glaze. Sometimes the budget does not allow to double-glaze the whole building. So the question is: Where to place the double glazed windows that can be afforded? There is a common belief that the best place are the South facing windows, because they don’t receive solar gains. This might be true for a house where all rooms are heated to the same degree, but most of our NZ houses are not. Therefore a different priority is more appropriate here: First insulate the rooms which are heated and where people spend most of their time. That has two advantages: 1. The occupants will get most of the comfort benefits from the double glazing. What’s the point of double glazing a South facing bedroom, where people might even open the windows overnight? 2. Because the occupied rooms are heated to higher temperatures, also the potential heat losses are higher. So it makes sense to deal with the big losses first. How much heat is lost through windows? Windows not only allow a lot of solar gains, they also allow a lot of heat to be lost once the sun is gone or on an overcast day. A rule of thumb is that each m² of glazing looses about ten times as much heat as an average insulated m² of wall area! Double glazing roughly halves these losses. But keep in mind that even then, a m² of window still looses about five times as much heat as a m² of insulated wall. So, size your windows cautiously! Why is it important to insulate the slab perimeter? Heat lost from the slab moves in semicircles downward into the slab and then outward into the outside air. Because the heat from the center of the slab has a longer path to flow to the outside, the R-value of the slab center is higher than the R-value of the slab edges. Therefore it is more important to insulate the slab edges, than the center of the slab. When foil is black on one side and silver on the other side, is it important which side faces up to be an effective underfloor insulator? In practice foil is usually facing downward, because that reduces the dust collection on the shiny side. Of course foil only works facing a cavity. Another thing to keep in mind is that foil should not be used in roofspaces. There is a risk of condensation and any collected water might drop onto the ceiling lining and framing. How much sun energy comes through the window? A rule of thumb says that in clear sunshine the sun sends about 1000W of heat per m² perpendicular window area. That’s about the same as an average electric heater. Tolling up the window areas in your designs gives you an indication of the large amount of heat that enters a house through large windows, French doors or conservatories. If you don’t deal with that heat using overhangs, awnings, thermal mass, ventilation, etc. house can easily overheat. Especially West facing windows are prone to lead to overheating, because in the afternoon the house is usually already warm and the sun stands low over the horizon, so shines almost perpendicularly into the window. North facing windows are less dangerous, because the sun is high in the sky and can be easier kept out using overhangs. The sunshine also does not shine perpendicular into the windows, and so the actually captured sunshine is actually smaller. East facing windows can actually work quite well because they let a lot of morning sun in, which helps to heat up the house after a cold night. Does double-glazing help to reduce overheating through large windows on north-west walls?? In fact double glazing by itself will reduce solar gains only slightly. Window gains are characterised by their solar heat gain coefficient (SHGC). Clear single glazing has a SHGC of about 0.7, clear double glazing 0.61. So double glazing reduces the heat gains by about 10%, but that is usually not enough. 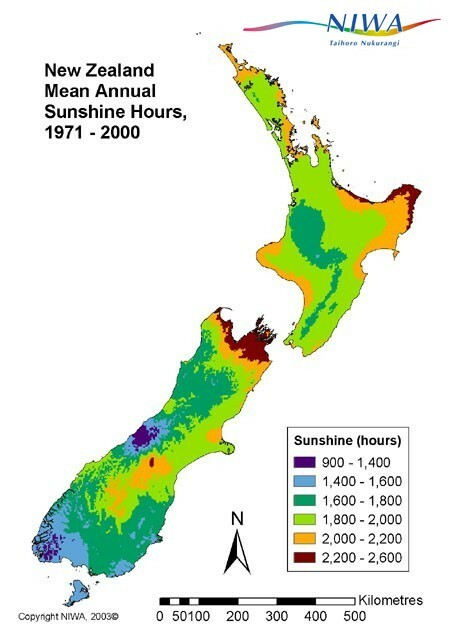 "Low-e coating" in New Zealand is mainly used for heat retention, but it also reduces the SHGC (to about 0.57 in double glazing). They achieve a slightly better performance for preventing overheating by having the low-e coating on the outer glass pane rather than the inner one. But in that scenario the low-e coating does not assist in retaining heat in the building during the winter, which will be an equally big problem with overly large windows, even if they face North or East. Blinds can work very well to control overheating if they are installed outside. Blinds on the inside are much less effective. The reason has to do with a characteristic of glass: Glass is transparent for (short-wave) visible sunlight, but not for (long-wave) infrared heat radiation. What happens is that visible sun light enters through the windows and hits the blinds. Some or most of the light is absorbed by the blinds (more for dark blinds, less for bright ones). These warm up and then re-radiate the heat out as long-wave infrared radiation. The problem is that the long-wave radiation can’t get back out through the window, because the glass is opaque for it. So the system works like a filter, letting heat in, but not out. Therefore bright blinds, which reflect most of the sunlight back as visible light, can work reasonably well. But in the end blinds really work best when installed on the outside. Thermal mass has two benefits: It helps to avoid overheating and it stores free heat, so it can be used later when the sun is gone. Houses with large windows can easily overheat, if the solar gains are not controlled. Surplus gains can be controlled by either keeping the surplus sun out (awnings, overhangs, blinds), by getting rid of the heat (ventilation) or by absorbing the heat in thermal mass. Thermal mass will work as an automatic buffer, which absorbs surplus heat just at the time when the house starts overheating. Unlike static overhangs, which are fixed and don’t respond to the weather condition, or awnings and ventilation, which need occupant control, thermal mass just sits there and works automatically when needed. The house will therefore have a much more stable indoor temperature. The thermal mass option also has the advantage that the free solar heat is not wasted and can be used later to warm the room when the sun is gone and the rooms cool down. Keep in mind that this mechanism only is a bonus if the heat is free heat, i.e. solar heat for example. There is no point in heating up thermal mass with a heater to retrieve the same heat later on. You might as well use your heater to heat the room directly when the warmth is needed. Therefore thermal mass does only make sense in combination with suitable window designs. How much thermal mass is best? As a rule of thumb a slab itself has enough thermal mass to capture typical day/night swings of heat transfer. So, it is generally OK to insulate underneath the slab, and massive concrete walls are in most cases not needed. It is however important that the concrete is not covered with carpet or other floor coverings which have a noticeable R-value. Carpet and underlay has an R-value of about R-0.4. So for heat to be stored in the concrete it has to travel through R-0.4 into the slab and then again through R-0.4 to travel back into the room when it is used to warm the room once the sun is gone. Where to place the thermal mass? The most effective way to get heat into thermal mass is via direct radiation. That means that you should try to place the mass so that sunlight directly hits it. Mass works much less effective when it is placed somewhere else in the building, because in that case, heat from the sunlight is first transformed into warm air. Then the heat has to transfer from the air into the mass. This process is much less effective than direct sunlight hitting the mass. Send me an e-mail if you have other questions, which should be included here: designnavigator@gmail.com.